The Foxearth dogs live in the heart of the rural Shropshire countryside of England. 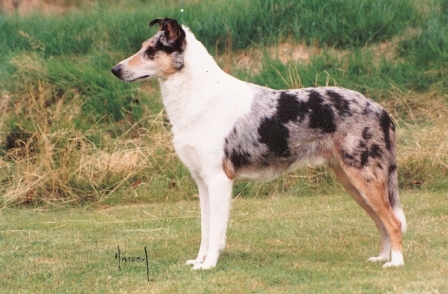 There have been Collies and Dachshunds in the kennel since the late 1960's - starting with Rough and then Smooth Collies. Birgit's enthusiasm for Dachshunds having followed her over to this country in the late 1970's. We have also had an interest in other breeds, notably the Polish Lowland Sheepdog and have bred and exported top winners. Shetland Sheepdogs and Cavalier King Charles Spaniels have also borne the Foxearth name. Please note - we no longer show or breed Polish Lowlands, Shetland Sheepdogs or Cavaliers. At Foxearth we are committed to breeding sound, healthy puppies that conform to the breed standard. All our puppies are eye checked between 6 - 8 weeks of age, are wormed, innoculated and health checked. We are constantly striving for Excellence. We often have puppies and older stock for sale to show or companion homes - telephone email us for information. The late great Ch Sharidon Silver Phantom at Foxearth - still one of the breed's outstanding sires and still the breed record holder.